2.Titan---Earth elemental melee attacks and occassionally "Wraith of the Earth"
3.Shemzal(spelling?) 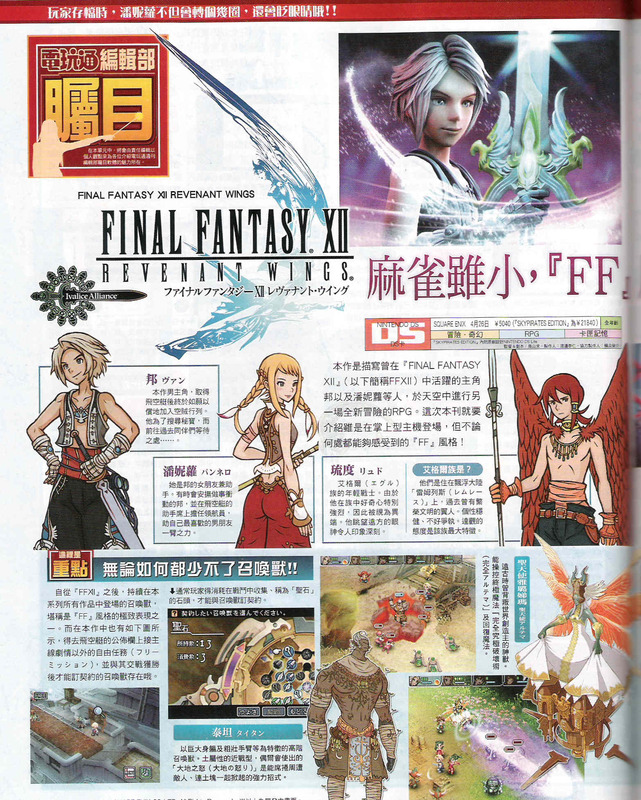 ---Just a description that has already been said in FFXII if I'm not wrong. His gun attacks are lightning element based. Vaan gets a sword(shown before in previous videos) from an unknown person.It's known as the Holy Sword Anasutashia, with the name meaning rebirth/reborn/revive. It was previously sealed by a Aegyl warrior. Disappears once it performs its duties and appears for a person with an unshakable determination to fulfil a wish. There are Lemures symbols on the sword, of wings and birds. The Aegyl image appears on the holder(what's the word for this?) of the sword too. 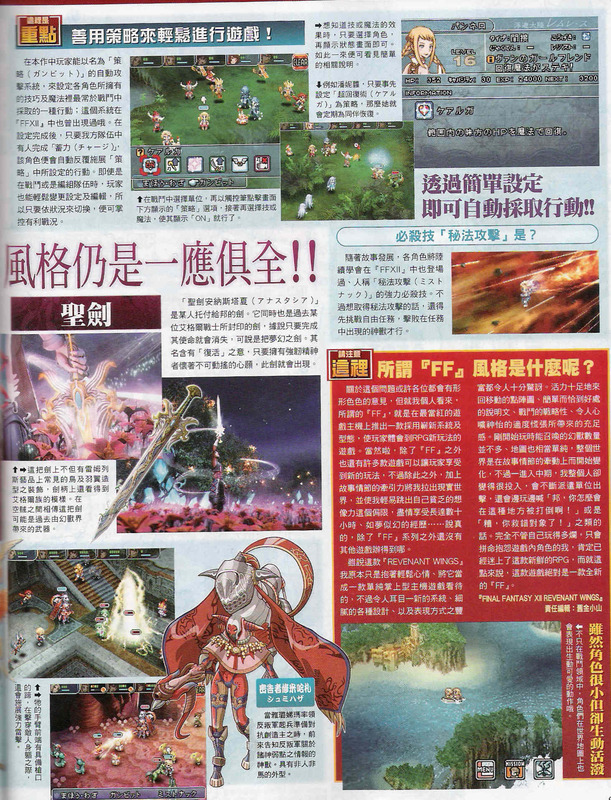 Word among the Sky pirates says that the sword might have come from the world of the summon monsters(Genjukai---not sure if this is right)(Summon monsters as in the new ones, Ultima and the rest of the espers are not Genjuu). At last new info on gambits. Seems like its much simplier this time.Just set up the gambit to on and once the charge timer is full the action will be performed. Status screen for Penelo shows that she's of the support type, so characters are confimed to have type differences like summons.She's also said to be Vaan's girlfriend and is good at curative magic. There's this blue icon at the top right of that screen and it is under the term for "attack"(kougeki) maybe it's the symbol for curative attacks. There's a weakness attribute(jyakuten) also and for her its just a dash. And there's this attribute (rejisuto), not sure what it means. Lastly some rather pointless tidbit---Penelo turns/dances and blinks when you save your game. Thanks for the info. The game looks really awesome. looks like i better order a ds then. 100 aren't they?